Believe it or not, the paint job above was the culmination of my mate DANTER’s first attempt at a Kryloned Blaster. OK, OK. He didn’t actually use Krylon and he’s spent something like 30 years building sci-fi props so he’s accumulated deep skills, but you get the point. I like Kryloned Blasters. But, like Mil Done Right, it has to be a spot-on job. I also think that Krylon jobs are only really appropriate to mil builds. 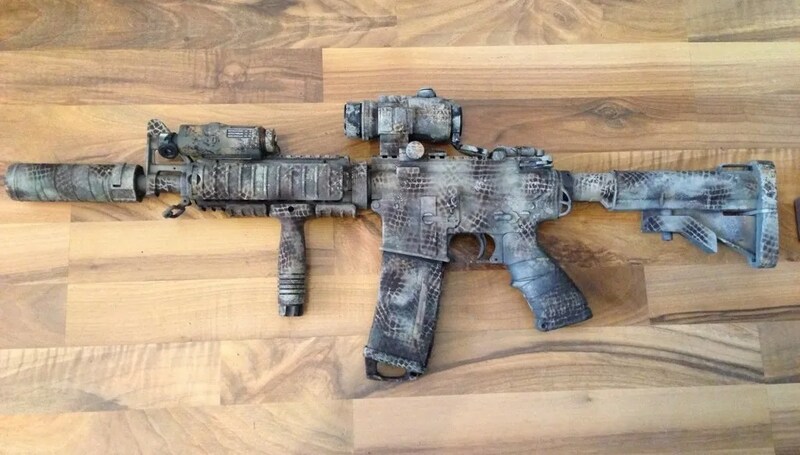 Krylon on a civilian build looks a bit odd and I think that Cerakote is the way to go there – or dipping for more complex colourways. However, Krylon is forgiving. Make a mess of the design? Acetone* or simply spray over it (but not so many times that the weight of the gun is doubled by the layers of paint). 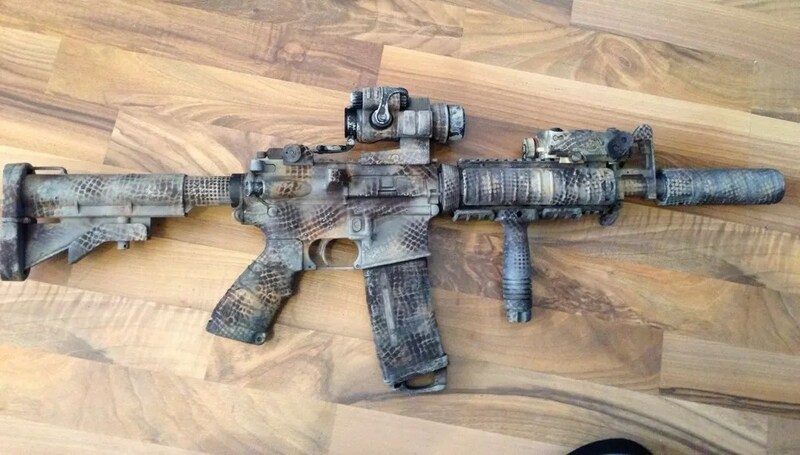 So, for most people, Krylon is an accessible way of dressing up their blaster, with little risk. You just need the balls to do it and the resolve to go deep. You can read about the process DANTER went through to spray his blaster and how things evolved here (he used Halfords paint, BTW). The irony is, John’s paint job came out unexpectedly redolent of Kryptek – which is now DANTER’s camo of choice. *Don’t use acetone on plastic, kids. Use acetone-free nail varnish remover for the sensitive bits. DANTER just told me off.